Do you spend a lot of time in front of a computer because of your job? Do you come home and veg out in front of the TV, scrolling through your smartphone as you do so? If so, you’re susceptible to developing what’s called computer vision syndrome. This condition, which affects more than half of those with desk jobs, can be painful and uncomfortable. By seeing our Austin eye doctor, you can get some relief from your symptoms. 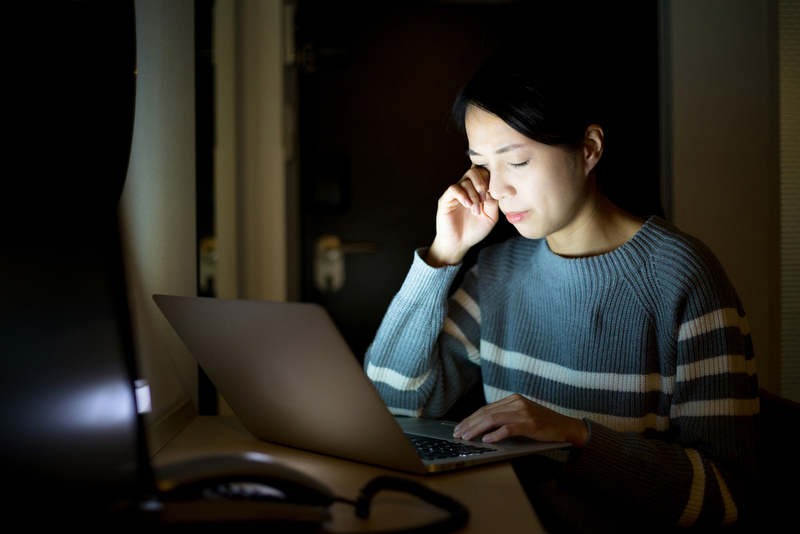 Computer vision syndrome is a condition that occurs from overexposure to screens. It can affect people of any age, from children to adults and even the elderly. It all depends on how much screen time an individual person gets. Screen time refers to all types of screens, not just computer or laptop screens. TV screens, smartphone screens, and tablet screens can all contribute to computer vision syndrome. Spending too much time looking at a screen often causes computer vision syndrome. More specifically, all that screen time affects the eyes’ focusing abilities. The eyes must continually focus as you do different tasks. For instance, talking on the phone for a few minutes and then turning back to your computer screen means plenty of refocusing for your eyes. Screens give off glare, flicker, and contrast, which can affect your eyes’ focusing abilities as well. The more time you spend in front of the screen, then, the more difficult it becomes to focus. These symptoms may come on all at once or you may experience just a few of them. You may rub at your eyes or take a painkiller for the discomfort, but these symptoms keep coming back. If you suffer from computer vision syndrome, it’s recommended you see our optometrist. They’ll test you for the condition and then suggest some adjustments you can make around the office and at home. These should lessen the rate of the uncomfortable symptoms mentioned above. Change your computer’s font size, screen contrast, and brightness. Step away from the computer and all screens for a few minutes. Take these small breaks throughout the day. Reduce glare by rearranging your office, getting a dimmer switch, using window shades, and changing your computer settings. Call Your Optometrist in Austin for Vision Care! Are you looking for an eye doctor for vision service and care? Contact us at Austin Vision Center. As your optometrist in Austin, we offer many services, including frame section, eye disease management, vision therapy, glaucoma treatment, dry eye treatment, cataracts treatment, sunglasses fittings, sports vision treatment, computer vision treatment, vision therapy, specialty contacts fittings, LASIK, eye and vision exams, and contact lens exams. To learn more or schedule an appointment today, please give us a call at 512-477-2282 or visit us at 2415 Exposition Boulevard, Suite D.